For hours, the play in Monday’s Game 12 of the World Chess Championship was filthy. Then it was weird. Things did not look drawish! But because of a remarkable decision by the world’s top grandmaster, they ended in a draw anyway. Over more than two weeks, more than 600 moves, 48 hours of play, one scandalous video and one black eye, the world’s top two grandmasters have now fought to a dozen straight draws. The World Chess Championship match between Norway’s Magnus Carlsen and the U.S.’s Fabiano Caruana remains deadlocked at the end of regulation, and the title will be now be decided by speedy tie-breaking games including, perhaps, a sudden-death format known as Armageddon. “This is going to get really dirty, really soon,” said Levon Aronian, the world No. 11, on a Chess.com broadcast. Sharp, gnarly and double-edged attacks appeared to be arriving soon, and the game was surely bound to be the first decisive result of the match. Surely! Caruana thought for about 25 minutes before making his 17th move. It’s hard to blame him, as the position on the board was very complicated. Worse for Caruana, it soon became complicated in a way that favored the Norwegian. “It looks like black is having all the fun in the position,” the grandmaster Robert Hess said after Caruana’s 21st move. All of black’s cavalry was mounted and armored and ready to charge. Black had more space in which to prepare its plans, and its bishops would likely soon eye an attack on the kingside. Undeterred, with his 21st and 22nd moves — rook to h2 and castling on the queenside, readying a heavy battery — Caruana signaled his willingness to fight. It was a willingness that led to real trouble. After Caruana’s 25th move, he was down more than 30 minutes on the clock and the equivalent of nearly two pawns, according to a supercomputer analyzing the game. The middlegame became a wild rumpus, and a scary one for fans of the American, one that neither human grandmasters nor chess superengines could make all that much sense of. Swings in advantage were wild, and time pressure was mounting. After Carlsen’s 31st move, Caruana had less than nine minutes remaining and faced this position. An attack was coming Caruana’s way, his time was dangerously low, and he was about to make the eight most important moves of his life2 under various flavors of high pressure. But Carlsen reached out his hand before Caruana could move and offered a draw — a pacifistic bolt from the blue. Caruana happily shook it. I’m not a grandmaster — far from it — but the position above looks nothing like a draw to me. There are, to put it professionally, soooooo many pieces left, including a ton of firepower, plus a pawn rolling down the left flank for black and various pieces that are under attack. And yet, a draw. Another draw. Caruana said he was surprised by the draw offer. So was everyone else. Let’s leave a deeper discussion of whether Carlsen’s shocking gesture is good for chess for later (it’s absolutely not) and take a look at how we got here. They’ll play a mini-match of four rapid games, in which each player gets 25 minutes plus 10 bonus seconds after each move. Points will be awarded as they were during regulation: 1 point for a win, half a point each for a draw. If the score is still tied after those four games, they’ll play a mini-match of two blitz games, in which each player gets five minutes plus three bonus seconds after each move. If that’s tied, they’ll play another and another and so on, for up to five mini-matches, or 10 total blitz games. If all of those two-game blitz matches are tied, they’ll play a single game of Armageddon. In this format, white gets five minutes, black gets four minutes, and a draw counts as a win for black. Lots are drawn (no pun intended) to determine who gets which color. For the risk averse grandmaster, there was an incentive to head to tiebreakers: The 1 million pound prize fund is divided 60-40 to the winner, unless the match is decided in tiebreakers, in which case, it’s 55-45. But who will win 55 percent of the money? 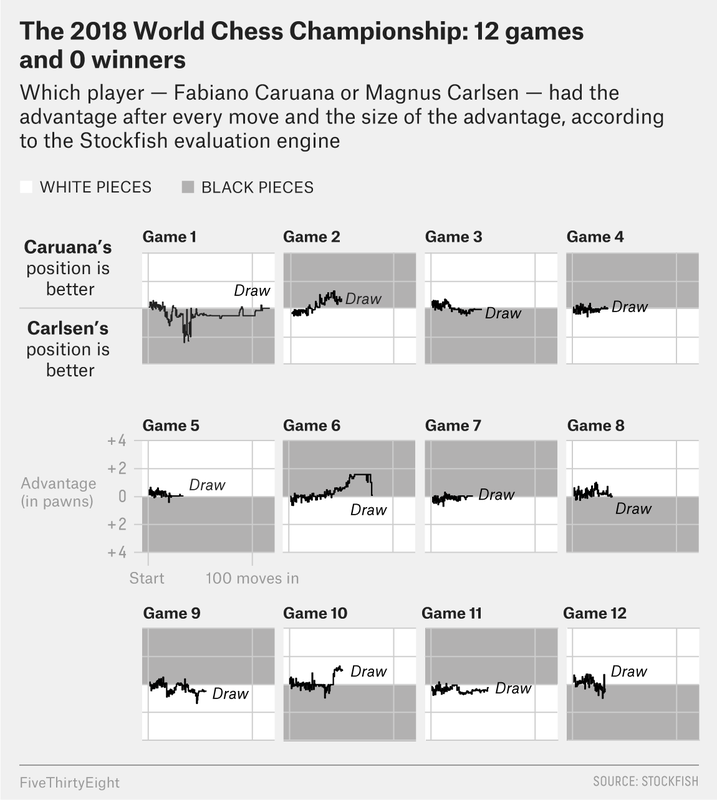 Probably Carlsen, and the faster the tiebreakers get, the bigger Carlsen’s advantage. To see why, let’s do a little math to calculate each player’s win probability in each potential round of tiebreakers. First, we need some measure of the players’ strengths in the speedier formats — I’ll use FIDE’s Elo ratings. Carlsen’s rapid rating is 2880, and his blitz rating is 2939; Caruana’s rapid rating is 2789, and his blitz rating is 2767. We also need a measure of how likely draws are in these faster formats. I’ll use historical data. In last year’s World Rapid Championship, for example, about 30 percent of the games were draws. In last year’s World Blitz Championship (which Carlsen won), about 20 percent of the games were draws. When will the chess end? And will it end in Armageddon? While I hate to disappoint, these somewhat crude calculations suggest only a 0.02 percent — or 1-in-5,000 — chance of Armageddon at the World Chess Championship. Then again, maybe the conventional wisdom is all wrong. For what it’s worth, the longtime world champion Garry Kasparov reassessed his own prediction of the tiebreakers following Monday’s draw. The tie-breaking games begin Wednesday at 10 a.m. Eastern, and a world champion will be crowned. I’ll be covering them here and on Twitter. He’d receive more time after his 40th move.